Content is disorganized in WordPress. OrganizeWP brings it together! Easily sort your existing content with a simple drag and drop. Any post type, any time! Instantly search your content titles to find that entry you need to edit. No need to hunt for an edit link any more, find your content in seconds! Viewing your Pages will no longer be littered with one-off landing pages. OrganizeWP separates them from your main site structure, preventing clutter. Easily create and manage custom post types and taxonomies, it's never been easier to build new content types in WordPress! OrganizeWP follows WordPress’ Requirements except for the minimum supported version of PHP; OrganizeWP requires PHP 5.4+. Yes! OrganizeWP was built to work with any theme and any plugin you may be using. Will my filters and columns continue to work? OrganizeWP aims to remove clutter and streamline the content management process. As a result only entry titles and relevant actions (e.g. View, Edit) are displayed for each entry. 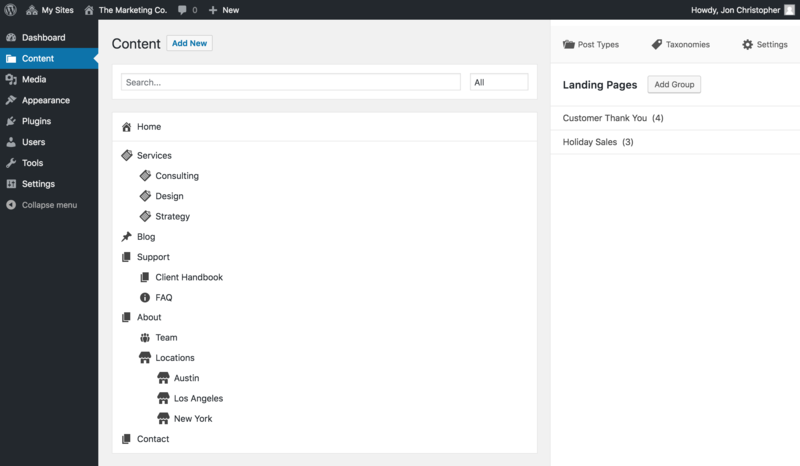 The filters and columns displayed on standard WordPress post listing screens (e.g. Category filter, Author column, etc) are not displayed in OrganizeWP, but you can always visit those standard post listing screens for access. What changes are made to my site? OrganizeWP utilizes the menu_order property available to all posts. Sorting entries with OrganizeWP will alter applicable menu_order properties. How do I receive support? How do updates work? An active license entitles you to support and updates of OrganizeWP. Support is available within your Account. By entering your license key on the Settings page within OrganizeWP you will receive automatic updates as they are available, as it is with plugins you have installed from wordpress.org. How do development and staging sites work with the license? Development and staging sites are exempt from the site limit for a license. There is some automatic detection built in for development and staging sites, but you can always open a support ticket to have additional development/staging sites added to your license.